Launched ePrognosis in January 2012. Launched mobile-friendly responsive web-design version of ePrognosis this summer (2013). Responsive web design allows you to access ePrognosis from a web browser on any size device - a PC, laptop, tablet, or phone. The website will automatically resize the browser window and the information in the window for the size of screen you are using. ePrognosis users said the "bubbleview" home page was too complicated. They just wanted to be quickly pointed to the best index for the patient in front of them. We re-designed the landing page to be much simpler, asking easy questions that quickly take users to the highest quality index for the clinical situation at hand (e.g. a nursing home patient with dementia is taken immediatly to Susan Mitchell's index). 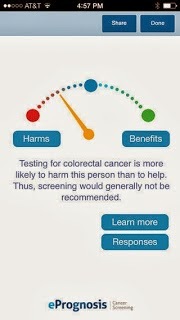 We launched ePrognosis: Cancer Screening - the app for iPhones and iPads - this week. See more about the app in this post here. Download the app here. How can you help? We need feedback from users! What are we doing right? What can be better? We welcome all feedback, from small fixes to big ideas. Even if you're not a user - tell us why not? With generous support from the John A Hartford Foundation, we are having a conference in January, 2014 to discuss Next Steps for ePrognosis. We are open to the idea of inviting and funding a particularly enthusiastic and helpful user or users to join our conference in San Francisco. What are the next steps for ePrognosis? Please respond in the comments! It's been a while since I've been here. I think I'll correct that error. I look forward to test driving the mobile app.